A self-determined relationship with the universe is the birth-right of all people. Cover photograph is by Chris Kent. 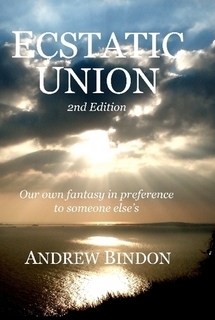 This 211 page hardback collection of your favourite Bindon poems and essays, includes poems such as "My favourite every thing", "How I do hate the poetry of others", "Bait and switch", "Parts of speech", 1st 2nd 3rd and Final "Irritation", "The next poem after this one", "A future worth not fighting for" and "Of course I'm f***ing depressed (a sonnet)". ... and ponderings on topics such as "How do we make the world a better place? ", "Why is the universe SO BIG? ", "The Location of Thinking", "Taking the universe for granted", and "How do we get to ecstatic union?" The perfect gift for Christmas or Valentines day. Really the perfect gift for any day. There is a Like! page for this book on Facebook here: Ecstatic Union Book Like Page. Also there is a Facebook Group here for people who want to talk about the book and so on. On these pages you can see some of the poems from the book, and chat to the author. The best way to get a copy of the book depends on where you live and how you prefer to do your shopping. Buy "Ecstatic Union" from Lulu in the USA. It looks to me like the price in the USA is: US $15.03. You can also use this channel to buy the book in other places. People in Australia might want to consider this channel, but check what freight cost you are getting charged. The freight cost Lulu charge to the UK was a lot last time I checked, although I have heard it has gotten better lately. Possibly Lulu have started printing in the UK? Also if you buy via Lulu, you can use this coupon code: LULUBOOKUK305 (Coupon expires 31 January 2012) - up to a maximum savings of about � / $75. (You have to be buying a lot of copies to exceed the maximum). My understanding is that this coupon code will give you an extra 25% off any orders of my book on Lulu (on top of the 40% discount already showing on the buy it now page). I think it will work for sales to anywhere in the world... the inclusion of "UK" into the code is cos I live in the UK - atleast I think so. For more information or to confirm or deny any of this information I suppose the best thing to do is contact Lulu. Buy "Ecstatic Union" from Amazon.co.uk in the UK. Notice that Amazon sell it at �.25 because they add on 150% to small publisher channel. BUT you can buy "through" Amazon for *** � *** plus p&p by choosing "Ecstaticunion" as your seller. This avoids paying Amazon for the privilege of dispatching it from their stock. OR Buy direct from the author! A possibly better (cheaper) way of getting the book is to buy direct from the author using Paypal. I would recommend everyone buying the book this way, because you will almost certainly get the best deal. Because I order copies on bulk orders, the shipping costs particularly in the UK are a lot less per unit. Click the button below to by the book direct from the author. I will dispatch within 24 hours (Monday to Friday) to anywhere in the world. A final thing you might like to do is buy the 1st Edition. The 2nd Edition is currently only available in Hardback. Whereas the 1st Edition is only available in Paperback. I wouldn't recommend doing this, because the 2nd Edition is a much nicer book in 100 different ways, but if you really want to it is available on Amazon.com for $6.66 here.